An egotistical surname search on ebay led me to this most interesting postmark! It turns out that Hovey was quite a ship. 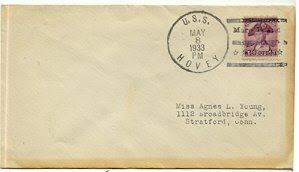 She was commissioned in October 1919 (a fellow libra!) and spent her life traveling to very fancy locales: Newport, RI; Dalmatia, Italy; Constantinople; Russia, Egypt...and that was all before she saw Pearl Harbor and a litany of other fights.